Easter’s here! So it’s the perfect time to indulge in cacao! We would love to see what you make with your Ashaninka Cacao! Our Cacao comes from the Asháninka tribes of the Peruvian Amazon. We work directly with their Cacao co-operative to ensure a fair deal for all, maintain organic farming practises, help protect their land from illegal logging and cocaine production, and enable them to maintain their ancient cultures and practises despite the threat of modernisation influencing their way of life. Asháninka means "our fellows" or "our kin-folk,” and we are honoured to be able to support and help these tribes to maintain their freedom and identity. Why Ceremonial Cacao & What We Offer? Our 100% raw, organic Asháninka Cacao is what we call ‘ceremonial grade,’ which means it is of the highest quality both as a food and energetically. Because we pay a fair price to the Asháninka tribes, and they lovingly grow, nurture and harvest the ancient Amazonian variety of criollo beans that grow naturally on their land, the Cacao can be used in sacred Plant Medicine Ceremony. When used as a Plant Medicine, Cacao works as a powerful heart opening tool. We offer three main Asháninka Cacao products and services! 100% raw organic non-GMO cacao is available to buy directly from our online shop. Hot chocolate Cacao drinking bars for corporate events, parties and everything in-between. 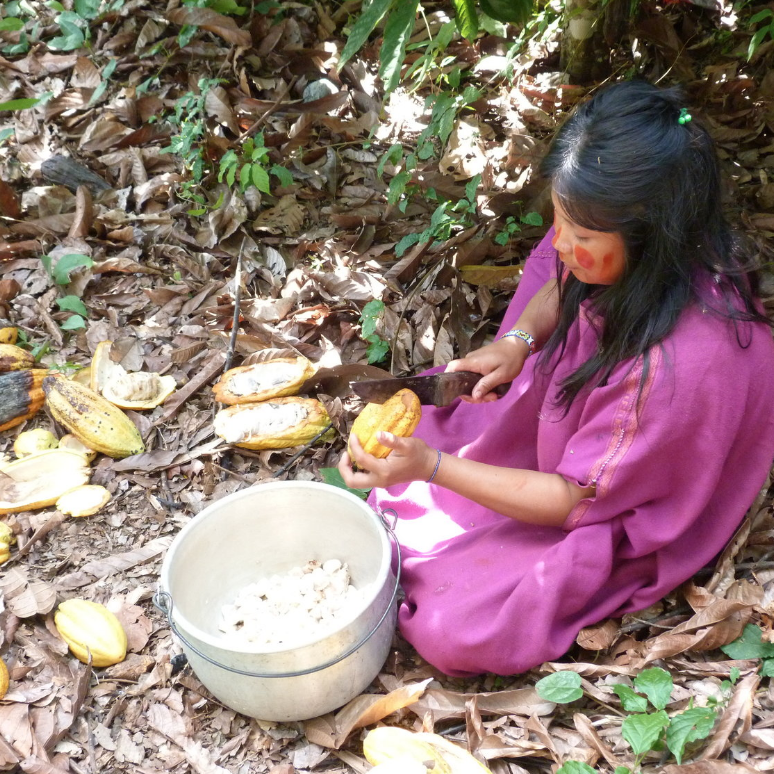 Cacao Ceremonies, in which Rebekah Shaman guides you through a heart opening shamanic journey.